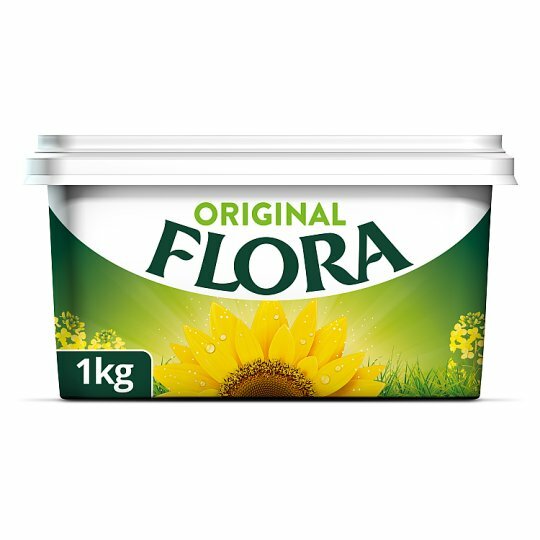 Flora Original; great new taste with 100% plant goodness*. Flora Original spread has been a family favourite for generations. Melt on toast, spread on sandwiches, mix into meals, Flora Original's new recipe is made from 100% of ingredients from natural origins. Naturally rich in Omega 3, with less saturated fat than butter, Flora has absolutely no preservatives, artificial colours or flavours. Not only does it taste great, it is vegan too. *Naturally contains Omega 3&6. Essential fats are needed for normal growth and development of children. A daily intake of 2g alpha-linolenic acid and 10g linoleic acid is needed. 2 x 10g servings of Flora a day contribute a significant amount to this. Keep refrigerated., Suitable for freezing, defrost in refrigerator., For Best Before Date see lid.